After what seems weeks (okay 2 weeks) of swearing at the computer, I have the station fully set up and ready to run for the contest season. In this screen shot you can see LP-Pan giving me a visual display of the band, CW Skimmer decoding a signal, and N1MM logger running. I had most of this running on an old XP computer two weeks ago, but I was at 100 percent processor capacity. So thinking it would be too much work to upgrade to a bigger processor on that machine, I bought a basic new gaming computer with Vista, a high-powered processor and lots of RAM. That made sense to me. I could get the machine for $500 or so, move the sound card and extra port cards from the other machine and be ready to run. If Vista was a problem, I could downgrade to XP. I took part in the Illinois QSO party today, racking up arond 250 contacts in about five hours of operating. The K3 with the LP-Pan peformed great, and I'm ready for Sweepstakes in two weeks. I even plugged in the microphone and did 40-some phone contacts on 40. Here's a screen shot of the setup, ready to rock and roll. You can see N1MM logger ready to control either radio, and the PowerSDR is showing the bandscope from the K3. If I see a strong signal on the bandscope I can click on it and the radio will move to that spot. And I'm just getting started with this. I've added the LP Panadaptor from Telepost to the K3 last week. The LP-PAN take an IF output from the K3 and adapts it into the sound card of a computer. 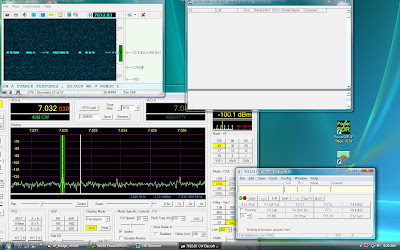 You can then use Power SDR software, the same software used to run the FLEX radios, and use the computer as your receiver with full filtering. You can use the computer as a second receiverm while using the K3 as your first receiver. It also gives you a very nice band scope you can use while choosing to use either the receiver in the radio or the computer. In short, it adds a whole lot of versatility to the K3. It also adds complexity. Getting this all set up isn't for the computer illiterate, or someone who doesn't want to spend some time reading manuals, user groups, and puzzling through getting all the settings tweaked. Enjoy the video.